PREPARATIONS for this year’s Omagongo Cultural Festival – which will take place this month at Ongandjera King Johannes Mupiya’s palace in the Uukwandongo village in the Omusati Region – are progressing well. The Ongandjera Traditional Authority is the host of this year’s event. Members of the community have already contributed more than 2,000 litres of omagongo and the preparatory committee of the festival has collected over N$200 000 during a gala dinner held at Okahao this past Saturday where deputy prime minister Netumbo Nandi-Ndeitwah was the guest of honour.. The second gala dinner takes place in the Roman Catholic hospital hall in Windhoek Thursday evening and prime minister Saara Kuugongelwa-Amadhila will deliver a keynote address. The Omagongo festival brings people together to socialize and to enjoy omagongo (a fermented marula juice). Feast-goers are entertained by traditional dancers and the event serves as platform to exchange ideas and to transmit customary norms and traditions to the younger generation. The festival has now become a national event and is even recognized internationally as an intangible cultural heritage of humanity. “King Mupiya has invited all traditional communities in Namibia and many have already confirmed their attendance,” said Niilo Taapopi, the chairperson of the preparatory committee. According to him, the festival will take place over two days. On the 26th there will be a social evening where experts will deliver speeches on customary norms. There will also be performances by traditional dancers and various musicians. The main event will take place on the 27th. Vice president Nangolo Mbumba will represent President Hage Geingob as the keynote speaker. Founding president Sam Nujoma, who is the patron of the festival, will also deliver a speech. 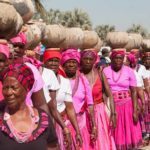 The Omusati region is hosting the Omagongo festival for the third consecutive year. The 2017 event took place at Chief Herman Iipumbu’s residence at Onamega and the 2018 event was held at King Shikongo Taapopi’s palace at Tsandi. The 2020 host will most likely be announced on 27 April.